Most babies love the soothing comfort and motion of being rocked and cradled in mom’s arms. That’s why, with 4 soothing rock and glide motions, calming vibrations, and a soft, padded seat, Fisher-Price® 4-in-1 Rock ‘n Glide Soother was designed to mimic the soothing motion and comfort of baby being cradled, rocked, and soothed. It’s actually two babygear must-haves in one-with four different ways to move (and help soothe) baby! Baby can rock or glide head-to-toe or side-to-side, with optional, battery-powered calming vibrations. Just choose rock or glide mode, then turn the rock & glide seat to select head-to-toe or side-to-side motion. (The seat rotates 360° degrees, so it’s easy to keep baby in sight!) Convenient foot pedal operation lets you quickly turn AC-powered gliding motion on or off; music and nature sounds help soothe and comfort baby, too! 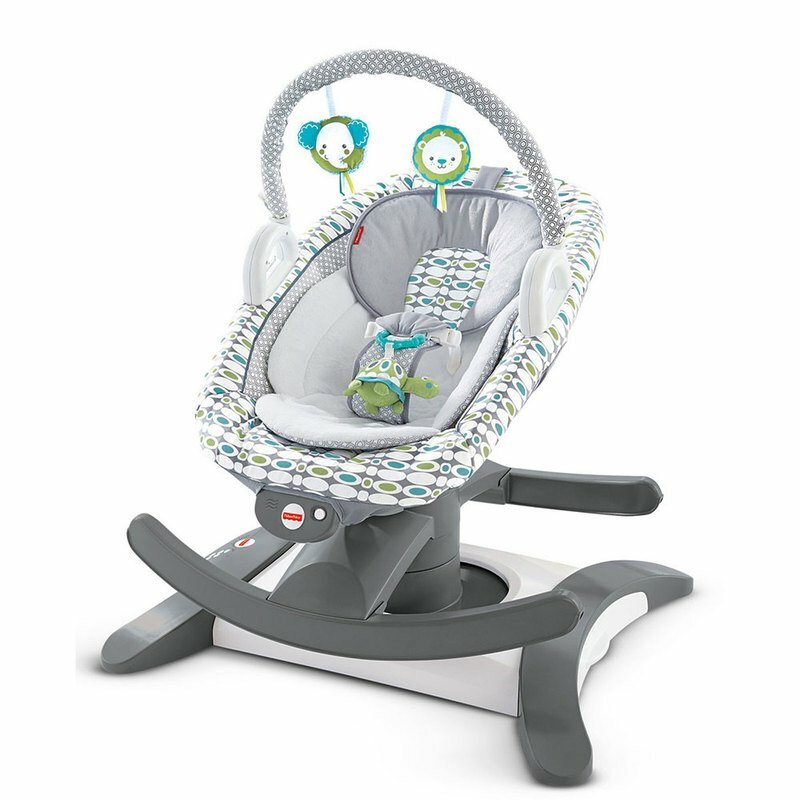 It’s quick and easy to convert 4-in-1 Rock ‘n Glide Soother from a powered glider to a cozy cradle rocker-just lift the calming vibrations rocker seat from the glider base. The portable seat with removable newborn head and body support insert adjusts to 2 different rock ‘n glide positions, so it grows with baby from newborn, to infant, to older baby. Choose reclined for newborns, infants, and soothing or napping; or inclined for older babies and play time! The removable toy bar keeps baby entertained with two soft toys overhead, with a linkable turtle toy for hands-on fun, too!